CLEVER SOLUTIONS to real needs inspire me. Clever, innovative, economical, simple-to-use solutions. Achievable. Accessible. Especially those that follow that principle you find in the permaculture design system that solutions should produce a yield, however it is that you want to measure that. I wrote awhile ago about one of these clever, innovative solutions called Loomio, online discussion software that uses something like the Dynamic Governance model to reach solutions. A New Zealand innovation, it’s probably a better approach for community associations than what they presently use. But it’s not Loomio that I want to talk about here. What I want to discuss is a Melbourne solution that has elements in common with Loomio — it is open source, it utilises digital communications and the internet for good ends and it’s another technology suitable for community deployment. An additional benefit is that it follows that permaculture principle of producing a yield that is monetary, nutritional and community-building. Yes, you can eat it. Or, more accurately, you can eat what it facilitates. What is this thing called OFN? The Open Food Network (OFN) is an online marketplace that makes it easier to find, buy and sell local, sustainable food. The OFN is special in a lot of ways — but especially because it puts farmers and customers in control and puts transparency back into food supply chains. Farmers and customers in control? Now that sounds revolutionary. The idea of putting farmers and their customers in control of their own food supply chain appeals to me because buying food is a negotiation through a marketplace that is based on supply and willingness to pay. Often, you hear people saying that farmers should be the price setters, however this leaves out the buyer. Any equitable market system has to include both. Sounds good, yes? I suspect — in fact I can say that I know it is good because behind the OFN idea, along with others, are Kirsten Larsen, veteran food system innovator and researcher, and Serenity Hill, a well-named young woman working on doing something good in the world. It’s true. To an online world good software is the enabler of good things. Bad software, that created for evil purposes, deserves nothing more than a good hacking, some say. Good software is what the Open Food Foundation deals in. It’s a social enterprise, a not-for-profit agency developing open source solutions to those real problems I mentioned. The Open Food Network trading software is the Foundation’s first major initiative. The software is the connection tech, the glue or matrix, the sticky part that connects the source of the food we choose — farmers — with people seeking “affordable, quality food close to home” via “hubs” — the organisations “making the connection between you and your food” such as independent retailers, food co-operatives and farmers’ markets. Presently in beta testing, the software seeks to provide a networked solution that lists food suppliers, their location, the farm sources of what they offer, what price the farmer received and delivery options with an online payment system. 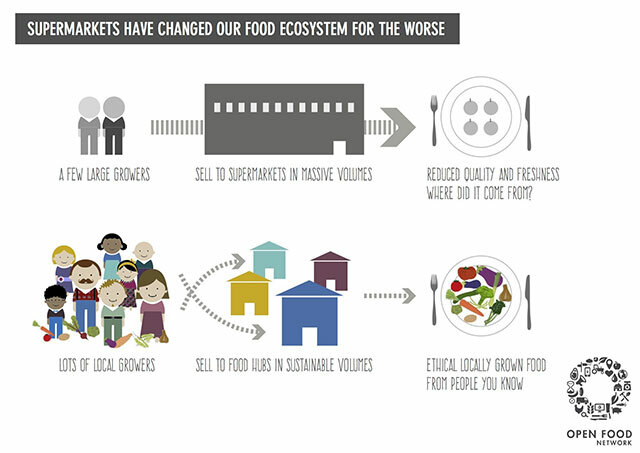 It’s a transparent system that lays open the workings of the food supply chain it facilitates. Wouldn’t it be interesting for the supermarket duopoly to disclose what they pay farmers and food processors?